Objective: Recently, there has been great interest in the use, abuse and over-prescribing of opioid analgesics for children. However, there is a paucity of evidence on patterns of prescribing of both narcotic and non-narcotic analgesics for children by dentists. Methods: We used a population-wide prescription drug database (PharmaNet) in British Columbia, Canada, to examine prescribing and dispensing of analgesics surrounding dental procedures. We examined all drugs prescribed for children by dentists between 1997 and 2013, as we had access to data on drug doses and days of medication supply. We also examined trends in the use of various narcotic and non-narcotic analgesics and benzodiazepines. Results: In total, 268 691 children were prescribed at least 1 study drug by a dentist. Codeine was the most frequently prescribed: 50% of children received codeine for more than 3 days. Duration of use of codeine was greatest among children ≥12 years, the longest duration of use being 5 days. Conclusions: Our study reveals that codeine prescription by dentists increased over the 16-year study period. Codeine is prescribed by dentists for 50% of children; prescriptions are for too long a duration to avoid potential morphine accumulation and are not in line with current treatment guidelines. 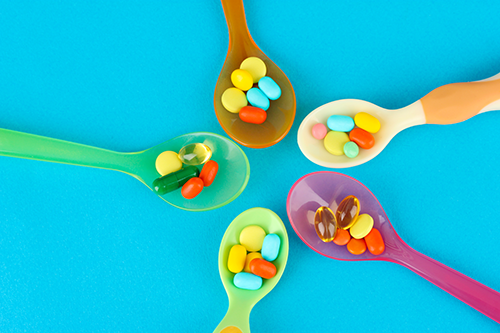 Analgesics are one of the most-prescribed classes of drugs for children. Recently, the increase in prescriptions for narcotic analgesics and the potential misuse of these drugs in adults has attracted particular interest. However, there is a paucity of evidence of trends in pediatric narcotic and non-narcotic analgesic prescribing. Although dentists are regular prescribers of analgesic medications, data on the frequency as well as duration of analgesic use prescribed by dentists for children is lacking. In a recent study of narcotic analgesic prescriptions following tooth extraction in the United States,1 the study population included only a small proportion of children (37%) and did not examine duration of use. We sought to address this lack of information by examining the rate of analgesic prescription, both narcotic and non-narcotic, by dentists for children in British Columbia, Canada. We used PharmaNet as the data source for our study.2 This database captures all prescription drugs dispensed in British Columbia and includes drug dose and day supply information. The day supply field in PharmaNet, which is entered by pharmacists, was used to quantify duration of use. Day supply is computed by dividing the total quantity of a drug by the number of daily doses. We had access to a dataset of all drugs prescribed to children ≤18 years of age from 1997 to 2013. We used descriptive statistics to analyze patterns in common analgesic medications prescribed by dentists, specifically trends for the following narcotic analgesics: codeine, morphine, hydromorphone, oxycodone, hydrocodone and tramadol. We also examined benzodiazepine prescriptions (lorazepam, clobazam, diazepam, clonezapam), ) intended for post-operative pain management, as they are used by dentists for their anxiolytic/sedative properties. Tramadol was also included in the list of study drugs. To factor in pediatric population growth in British Columbia, we also calculated a population-adjusted rate for codeine medications in children by dividing the number of users for each year by the population of children for that year3 to obtain a rate per million population. All statistical analyses were undertaken using SAS version 9.4. Our study group consisted of 268 691 children who had received at least 1 prescription of the drugs of interest from a dentist. Among all study drugs, the largest number of prescriptions was for codeine (Fig. 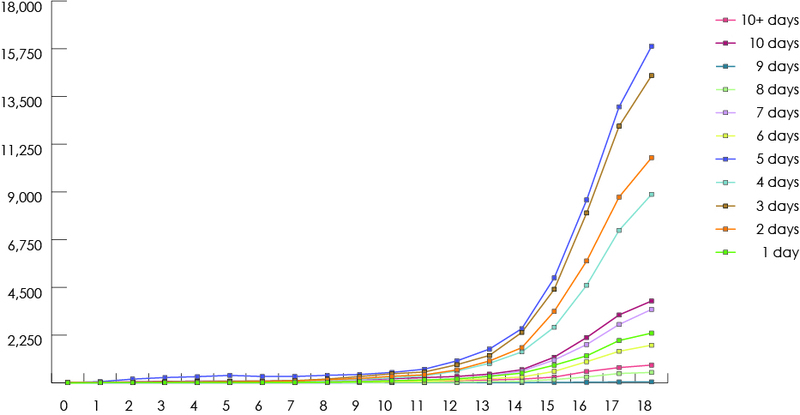 1), and 50% of children (n = 134 264) received codeine for more than 3 days (Fig. 2). The duration of codeine use increased rapidly with age among children ≥12 years, 5 days being the longest duration of use (Fig. 3). The use of tramadol increased markedly from 2005 to 2013 (Fig. 4). 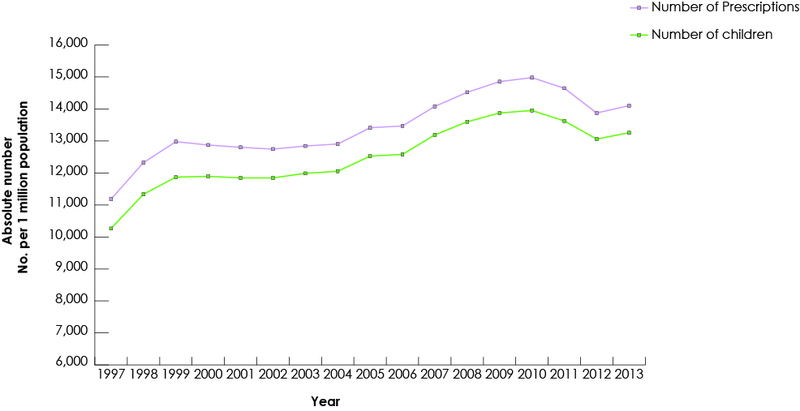 Figure 1: Trends in dentists’ prescription of codeine for children (≤18) in British Columbia, 1997–2013. 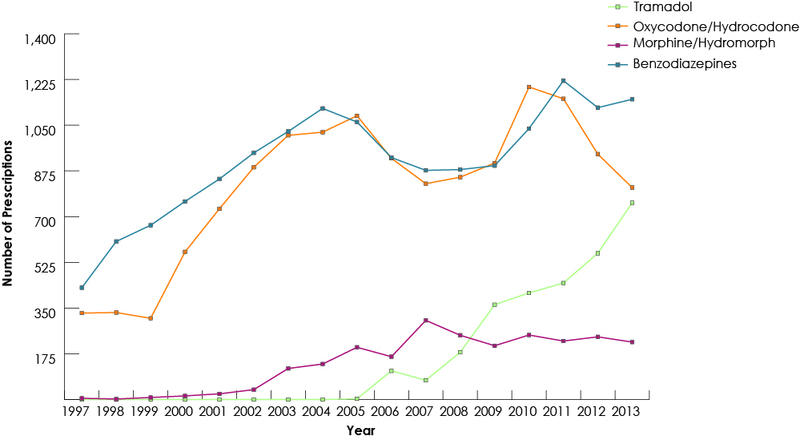 Figure 4: Trends in dentists’ prescription of benzodiazepine and non-codeine analgesics for children (≤18) in British Columbia, 1997–2013. During the study period, codeine was the most prescribed analgesic, with ibuprofen the most commonly prescribed non-narcotic analgesic. For children ≥12 years, a 5-day supply of codeine was commonly prescribed. Codeine is a commonly used narcotic among both children and adults as, unlike morphine, it does not require a triplicate prescription and at lower doses it is available behind the counter in pharmacies in British Columbia. However, in recent years, evidence of pharmacogenomic variation in codeine metabolism and related respiratory depression in children4 has led to drug label warnings about the use of codeine by children. In a recent study in the United States, Baker and colleagues1 used the Medicaid database to examine narcotic analgesic prescriptions dispensed after surgical tooth extractions between 2000 and 2010. They found that 42% of patients filled an opioid prescription within 7 days of a tooth extraction. However, the study included only a small sample of children. A 1-year cross-sectional study (2012–2013) in South Carolina9 examined dentists’ prescription of opioid medications using a large prescription database. It concluded that 99.9% of all opioid prescriptions were for immediate-release opioids. Children (≤21 years) accounted for 11.2% of opioids prescribed by dentists,9 although the study did not focus on children and did not have data on duration of prescriptions for analgesics written by dentists. Our study was limited in not identifying the type of dental procedures for which analgesics were prescribed, as codeine prescribing might differ among practice settings. Moreover, as most analgesics including codeine are prescribed on an as-needed basis, it is possible that the designated day supply field does not coincide with the actual number of days a medication was taken. Moreover, we could not account for over-the-counter codeine (available at a dose of 8 mg of codeine/325 mg acetaminophen). Dr. Etminan is an assistant professor in the Department of Ophthalmology and Visual Sciences, Faculty of Medicine, University of British Columbia, Vancouver, BC. Dr. Nouri is a certified specialist in pediatric dentistry at PDG Pediatric Dental Group, Vancouver, BC. Mr. Sodhi is a Master’s student in the Department of Experimental Medicine, Faculty of Medicine, University of British Columbia, Vancouver, BC. Dr. Carleton is professor of pediatrics and co-chair, division of translational therapeutics, senior clinician scientist, BC Children’s Hospital Research Institute, University of British Columbia, and director, Therapeutic Evaluation Unit, Provincial Health Services Authority, Vancouver, British Columbia. Acknowledgement: This study was funded by the Therapeutic Evaluation Unit of the British Columbia Provincial Health Services Authority. All inferences, opinions and conclusions drawn in this publication are those of the authors, and do not necessarily reflect the opinions or policies of the [British Columbia] Ministry of Health. Baker JA, Avorn J, Levin R, Bateman BT. Opioid prescribing after surgical extraction of teeth in Medicaid patients, 2000–2010. JAMA. 2016;315(15):1653-4. PharmaNet. Victoria: British Columbia Ministry of Health; 2014. Population estimates. Victoria: Government of British Columbia; n.d. Available: http://www.bcstats.gov.bc.ca/StatisticsBySubject/Demography/PopulationEstimates.aspx (accessed 28 Mar. 2017). Kelly LE, Rieder M, van den Anker J, Malkin B, Ross C, Neely MN, et al. More codeine fatalities after tonsillectomy in North American children. Pediatrics. 2012;129(5):e1343-7. Gaedigk A, Simon SD, Pearce RE, Bradford LD, Kennedy MJ, Leeder JS. The CYP2D6 activity score: translating genotype information into a qualitative measure of phenotype. Clin Pharmacol Ther. 2008;83(2):234-42. Madadi P, Amstutz U, Rieder M, Ito S, Fung V, Hwang S, et al. Clinical practice guideline: CPY2D6 genotyping for safe and efficacious codeine therapy. J Popul Ther Clin Pharmacol. 2013;20(3):e369-96. McLellan RA, Oscarson M, Seidegard J, Evans DA, Ingelman-Sundberg M. Frequent occurrence of CYP2D6 gene duplication in Saudi Arabians. Pharmacogenetics. 1997;7(3):187-91. Safety review update of codeine use in children; new Boxed Warning and Contraindication on use after tonsillectomy and/or adenoidectomy. Drug safety communication. Silver Spring, Md. : United States Food & Drug Administration; 2013. Available: http://www.fda.gov/Drugs/DrugSafety/ucm339112.htm (accessed 27 Aug. 2016). McCauley JL, Hyer JM, Ramakrishnan VR, Leite R, Melvin CL, Fillingim RB, et al. Dental opioid prescribing and multiple opioid prescriptions among dental patients: administrative data from the South Carolina prescription drug monitoring program. J Am Dent Assoc. 2016;147(7):537-44. Codeine for analgesia: restricted use in children because of reports of morphine toxicity. Drug safety update. London: Medicines and Healthcare Products Regulatory Agency; 2013. Available: https://www.gov.uk/drug-safety-update/codeine-for-analgesia-restricted-use-in-children-because-of-reports-of-morphine-toxicity (accessed 27 Aug. 2016). New safety measures for prescription codeine and hydrocodone to further restrict use in children and adolescents. Recalls and safety alerts. Ottawa: Health Canada; 2016. Available: http://healthycanadians.gc.ca/recall-alert-rappel-avis/hc-sc/2016/59584a-eng.php (accessed 28 Mar. 2017). Cooper SA, Engel J, Ladov M, Precheur H, Rosenheck A, Rauch D. Analgesic efficacy of an ibuprofen-codeine combination. Pharmacotherapy. 1982;2(3)162-7. Beaver WT. Aspirin and acetaminophen as constituents of analgesic combinations. Arch Intern Med. 1981;141(3 spec no.):293-300. Farinde A. Pediatric acetaminophen dosing. Protocol. New York: Medscape; 2015. Available: http://emedicine.medscape.com/article/2172407-overview (accessed 28 Mar. 2017). Farinde A. Pediatric ibuprofen oral dosing. Protocol. New York: Medscape; 2015. Available: http://emedicine.medscape.com/article/2172401-overview (accessed 28 Mar. 2017). Tramadol tablets. Professional drug information. Silver Springs, Md. : United States Food & Drug Administration; 2017. https://www.drugs.com/pro/tramadol-tablets.html (accessed 28 Mar. 2017). Rasubala L, Pernapati L, Velasquez X, Burk J, Ren YF. Impact of a mandatory prescription drug monitoring program on prescription of opioid analgesics by dentists. PLoS One. 2015;10(8):e0135957. Livingstone MJ, Groenewald CB, Rabbitts JA, Palermo TM. Codeine use among children in the United States: a nationally representative study from 1996 to 2013. Paediatr Anaesth. 2017;27(1):19-27. doi: 10.1111/pan.13033. Epub 2016 Oct 25.